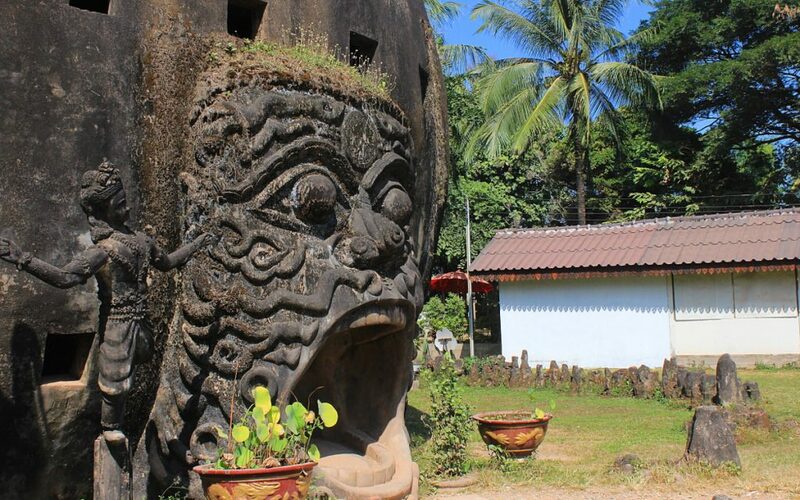 Buddha Park is one of the most eccentric tourist sight of Laos. 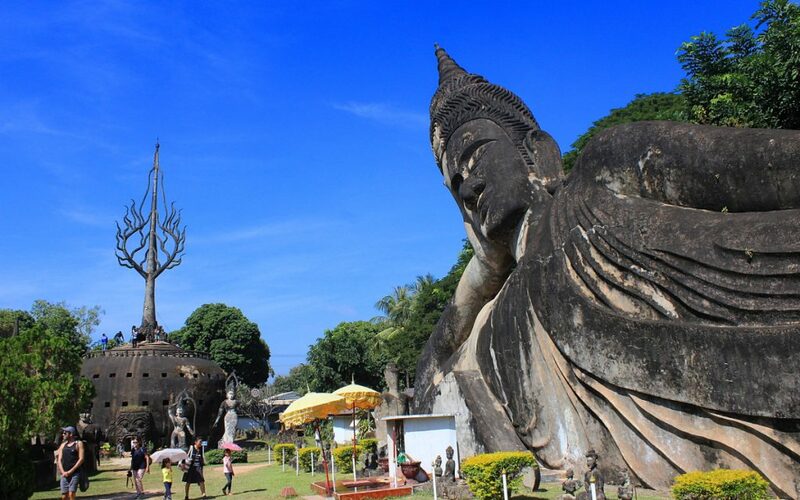 As the capital of Laos offers very little to see, a bus trip from Vientiane to Buddha Park makes a great addition to your itinerary in Laos. 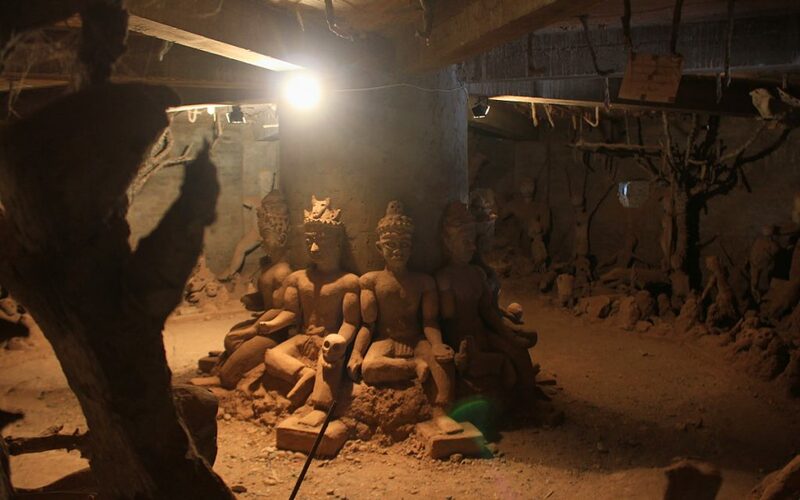 Here’s how you get to Buddha Park on a bus. 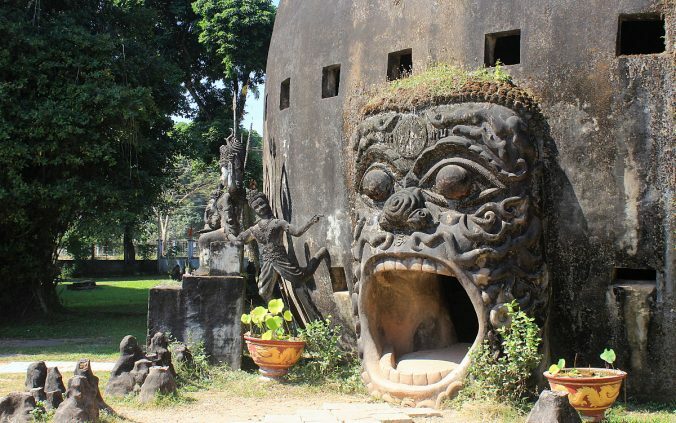 Buddha Park (Xieng Khuan) was started in 1958 by Bunleua Sulilat, a Thai mystic and sculpture artist. 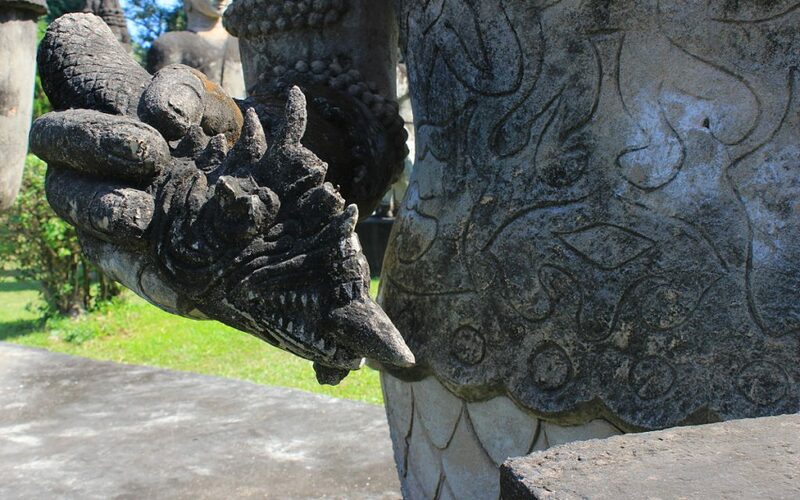 His statues in the sculpture park combine Hindu and Buddhist mythologies with Sulilat’s own additions, creating imaginative and detailed figures of Gods and other supernatural creatures. 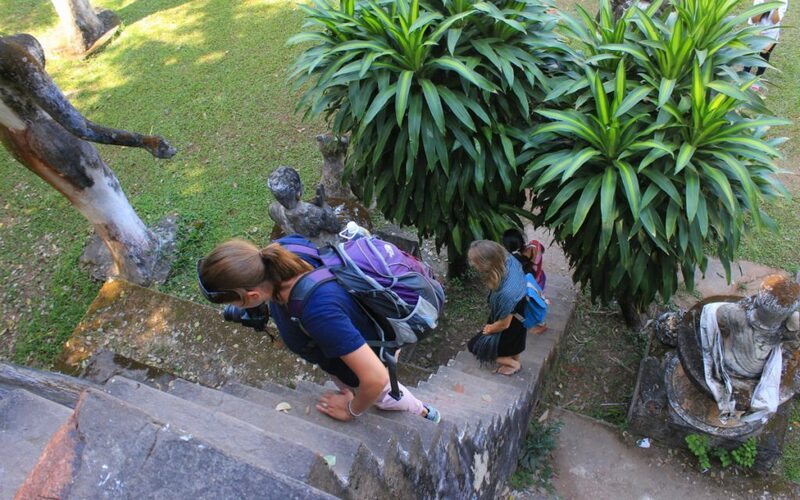 How to get to Buddha Park from Vientiane? 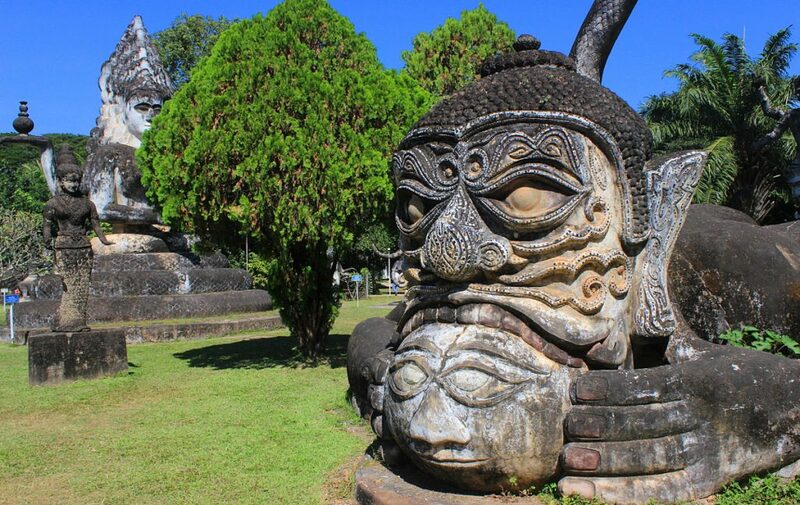 Buddha Park is about 25 kilometers southeast of Vientiane. Bus 14 from Vientiane to Buddha Park costs about 6000 Lao Kip (0.7$). The bus leaves from the central bus station (Talat Sao) of Vientiane every fifteen minutes. If you’ve downloaded MAPS.ME, the bus is even easier to find, as “Bus 14 to Buddha Park” is marked on the offline map. The bus ride from Vientiane to Buddha Park takes about one hour. Just don’t get out of the bus too early – the bus first stops by the Friendship Bridge between Laos and Thailand, where plenty of tourists with heavy luggage will drop off. 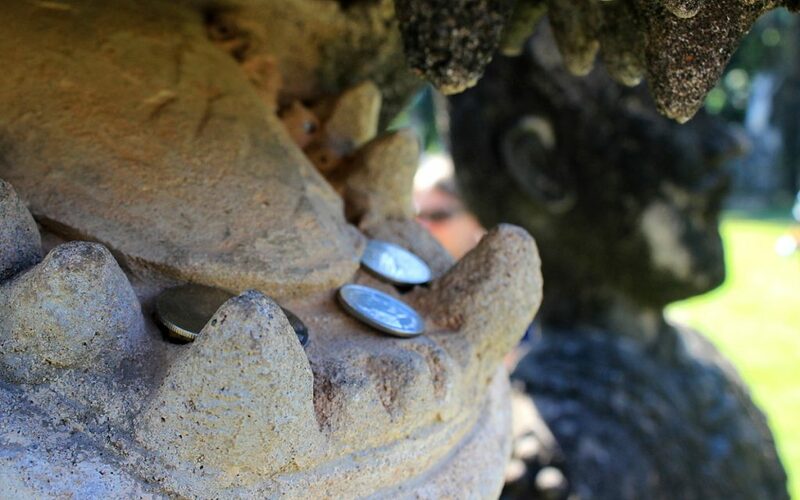 The entrance fee of Buddha Park is about 5000 Lao Kip (0.6$). A camera fee is mentioned in the Lonely Planet guide and the fee is mentioned on a sign in the ticket booth. However, the officers refused our extra money when we tried to pay it. So, enjoy these free photos from the site! On the right: A quite traditional reclining Buddha. On the left: a not-so-traditional giant pumpkin of afterlife. The statues of Buddha Park offer little explanation, so the visitors have to make their own interpretations about their meaning. I use the same type of pencil! This formation is called “The annoying guitarist disrupts the meditation”. Or at least that’s what I want to believe. …and this one is called “The frog eats the sun”. And this time I’m not even joking. The mouth of a crocodile. German backpackers Dorothy and Celine came from Vientiane to Buddha Park on the same bus, so we spent the day together. 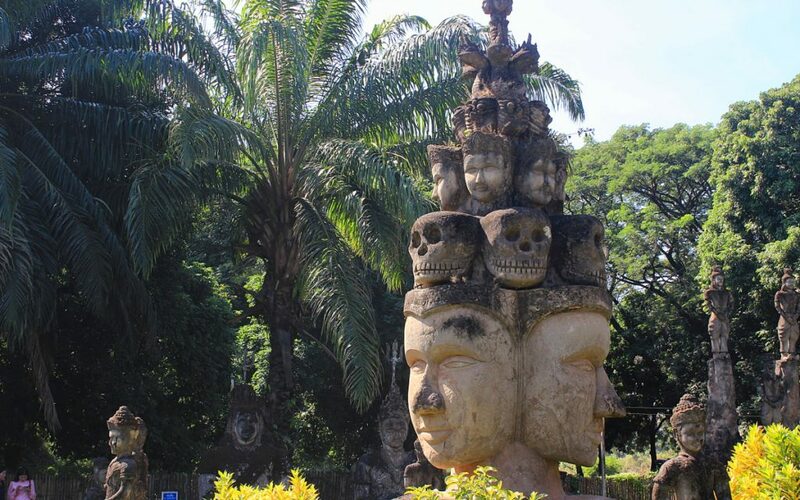 The skull figures of Buddha Park reminded me of Mexican Día de Muertos (Day of the Dead). From the outside, the so-called “pumpkin tower” looks less interesting than many of the other sculptures. 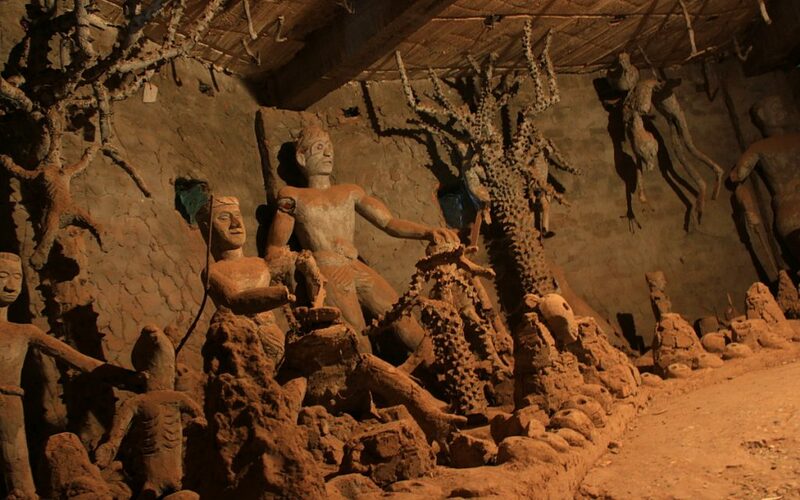 However, the inside of the structure is a definite highlight of Buddha Park. The pumpkin tower has three floors that represent hell, purgatory and heaven. Sulilat’s vision of hell is not a happy place. The sculpture park is not very large, and you can explore everything in less than an hour. 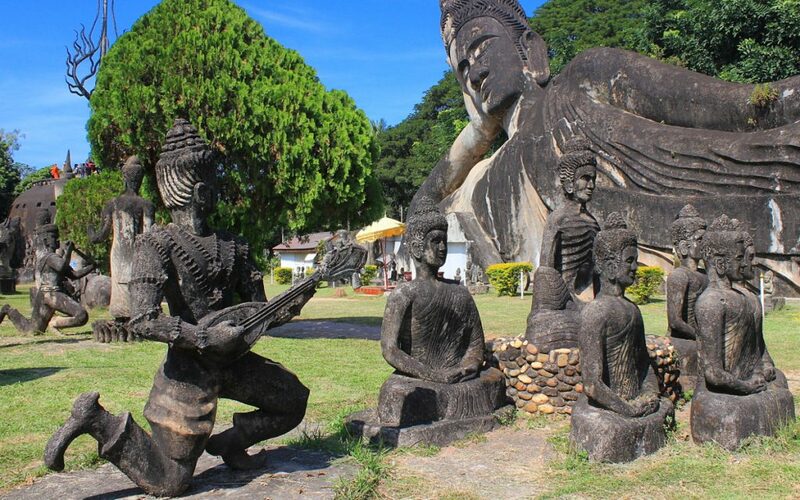 Next to Buddha Park is a restaurant that offers simple food and nice river views, but besides that, there’s not much else to do nearby. 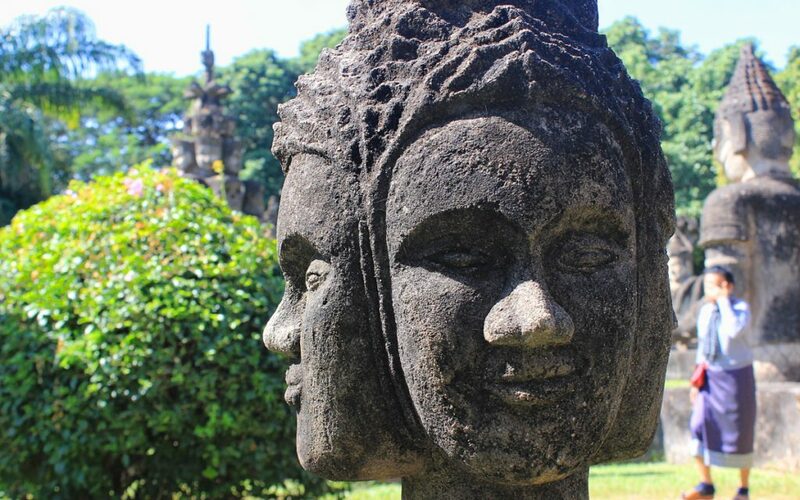 Even though the park is not very large, I found the place very intriguing, Buddha Park definitely became one of my favourite sights in Southeast Asia. In a way, it also reminded me of the Hill of Crosses in Šiauliai, Lithuania, one of the very first stops of my round the world trip. Both places feel very unique, and both are worth a visit if you’re nearby.